You'll be £10.99 closer to your next £10.00 credit when you purchase Museums of New York City. What's this? New York City is famous for its cavernous avenues, excellent restaurants, world-class shopping, and reputation as a leader in the arts. A walk along any of New York's bustling streets will take you past enticing stores, architecture, food, and cultural sites. With its wealth of attractions to tempt any visitor, there are none more interesting than the more than one hundred museums located throughout the city's five boroughs. Although dominated by famous institutions such as the Metropolitan Museum of Art, the Museum of Modern Art, and the Guggenheim, it is not surprising that New York City offers more than one hundred additional museums that feature an enormous range of interests and themes. In New York City you can visit the largest collection of toy boats in the world, the home of Louis Armstrong, the first capitol building of the United States, enter a late 19th-century tenement house, see Lincoln's manuscript of the Emancipation Proclamation, stand on the deck of a World War II aircraft carrier, and wonder at Latin American art and artifacts from pre- Colombian times to today. Here for the first time is a handy comprehensive guide to the public treasures of Gotham. 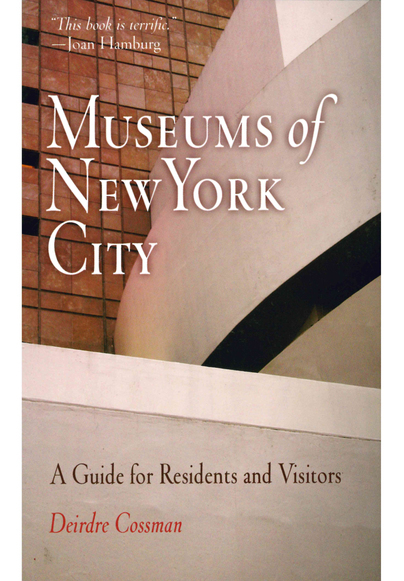 Full of information and places that will be unfamiliar even to those who have made the city their home, Museums of New York City: A Guide for Residents and Visitors is the ideal companion for anyone who enjoys exploring one of America's great cities.